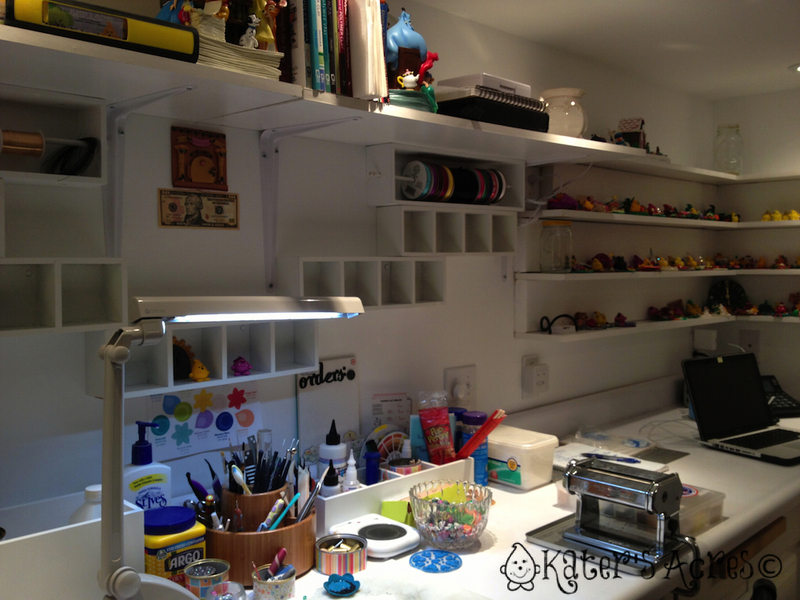 If you have spent any amount of time surfing around the internet searching for polymer clay artists, you are well aware that their studios vary in size and design. Some people have full studios the size of a small home and yet others have a folding TV tray they call home. Today we are going to talk about how you can come to an appreciation of your own polymer clay studio, whether small or big, part-time or full-time. More is always better; bigger is always better…or so they say. Society teaches us this misnomer each and every day. That being said, let me tell you a story…. My studio has moved and grown over the years. Before I was married it was housed in a table in my parents basement. When I got married, it found its way into our living room. And now it is in my basement in a separate space all of its own. But here’s the thing, at some point in your life, you have to realize that ‘there’s always more to have.’ This is especially true in the crafting world. No matter how much you have, there could always be more … Having ONE item is not the be-all-end-all that it used to be; there are new items to replace the old. People rarely downgrade their home or studio size, it’s our nature to constantly want to expand. Let me encourage you: learn to accept your polymer clay studio exactly as it is, whether desk, TV tray, room, or separate building. I’m sure there isn’t anyone who doesn’t desire to be an artist that doesn’t want (or need) more space. But if you were honest with yourself you’d realize there’s only so much space you can comfortably take care of & sustain. What works for one person, may not work for another. At the left you see a picture of my original studio … it consisted of a table in our living room. My stuff was always everywhere and it was virtually impossible to clean up. In fact, it became such an eye sore that I hesitated having company over for fear I would have to clean it. YIPES! Then my hubby, out of his love for me and Parker, gutted our basement and transformed it into a magical place where Parker and all his friends can magically come to life. (See my new “grown up” studio here). I love my new studio: being able to shut the door and walk away is fantastic! Getting to be completely surrounded by books, Parker sculpts, clay, & all my craft items in ONE place (and not a million like before). But as with all things there are downsides too, such as no air in the summer and no bathroom, save for 2 floors up. When my studio was in the living room, if I had an idea I could quickly run over to the table & sculpt it out…I could clay while my hubby watched TV… And now with my “grown up” polymer clay studio that has changed. Don’t get me wrong I would never go back; I love & cherish my studio. However, what I’m trying to say is that we need to be aware of what we do have and learn to cherish it, make the most of it, and make it work for your lifestyle. Learning to appreciate what you have is hard, but it’s something that will allow you more joy & freedom than coveting what you don’t have. Keep the tools you use most often close-by and in one place. If you scatter your tools about, it makes working that much harder. Use floss boxes and other organizing tools to help you stay as organized as possible. Squeeze every inch out of your space by growing “up” in your area instead of out; learn to be a stacking pro! And if you’re not a stacking pro, there are a lot of organizational pieces you can purchase that can make you a stacking pro. If your space is small, keep all extras (including that bowl of M&Ms) away from your creative space – this leaves more working room (and saves a few inches off your waste line). If you bake your creations in your home oven, have one cabinet or area dedicated to your polymer clay pans & cookie sheets you use to bake on. This makes baking your items quick, efficient, & easy. It also helps because you don’t have to remember: cookies …. or …. clay. Keep your craft items separated by type: one bin for paints, another for tools, another for beads, etc. This too will help in making your hobby fun & easy, especially in small spaces. When you’re done with the paint, throw in back in its bin and move onto the next thing. If you do not have a dedicated space (you work on whatever piece of furniture you can find) be sure to wipe down all your surfaces when you are finished. Remember that uncured polymer clay can eat through finishes on wood, so take the extra time & wipe off your surfaces. Thanks for joining me today! Leave your comments, thoughts, & ideas below. Don’t forget to join the series next week over at The Blue Bottle Tree with Ginger. Well,as you know my studio is my bedroom,my bedside table my workbench and my wardrobe is my craft store plus my oven! I have a small hologen oven on a shelf in a built in wardrobe and have downsiced my knicker drairers for my polymer clay tools books and anything else. I use snap boxes for seperate things as you suntested. Just one thing. ….im sure my creatures are being mischievous and movintage that one tool,piece of clay or my extra magnification glasses overnight before I go to craft. Every time I spend ages looking for the one thing essential to complete my piece only to find its been magicaly hidden away somehow! I do appreciate my little space and you really can afford to clay on a very small budget if you disapline your credit card hand to only what you really need. That’s the hardest thing, I’m like a magpie and I purloin random objects for my craft from friends and family to support my crafting. I just wish I had a but more disposable income to enrol with you proper and buy all the wonderful stuff on offer. Here in uk there are very few actual go to classes so I appreciate the freebees offered whilst understanding you need to make a living too. Thank you so much for letting me know. I’m so glad that you have found help and encouragement in your clay journey! Clay on my friend! Oh how nice it was to look at someone else’s clay space. I try so hard to get it all organized, and then ….. My present project is to get everything else off of my workspace. Then the problem is where to put it. I do too many things, clay is not all. Today my goal is to really make a change out there. I think I am in the mood to actually throw away some stuff. Better go do it before the urge dies. I definitely get what you mentioned about watching TV, having and idea and running over to sculpt it. I used to sculpt and watch TV, now I have a designated area and find myself having to decide ‘am I sculpting now’ or watching TV. It helps though, because I can be present in whatever I chose to do. Hahahaha Leah! You should love the cart at the bottom, since it’s yours! I do love my studio and considering the amount of time I spend in it, it’s a good thing! I am in the process of taking a very large studio down to one room, it is daunting ! Trying to figure out what I need close by and how to arrange it all. I moved from the bigger studio because of the cats and their love of laying on whatever I was working on ( even if I left for just a min ). I am looking forward to a closed off studio, my other one was in the front of the house so every time I open the door to someone, everything was there. I love reading about studios! I started working with polymer clay back in 1990 on my dining room table. Then I moved to a corner of our dreary unfinished basement. When we finished the basement, my husband moved all of his hobby things and our home office down there, and I took over the bedroom that was our home office. It’s not big, and it has evolved over the years, but I’ve learned to accept it’s limitations and work with them. I recently did a big studio remodel and now I wouldn’t change a thing! LOVE IT! Organization is KEY to any studio, no matter the size! I can’t wait to read next week’s post! Isn’t it funny how after you fall in love with something (be it reading, crafting, or lawn care) we as people always crave that “more” component. I find it fascinating! But I agree 100% with you Lisa, organization IS key!